I love a good salad, but I find that I usually get into ruts from time to time. I am constantly using the same ingredients and, well, it's boring. So I've been trying to jazz things up by trying new ingredients and flavor combos. 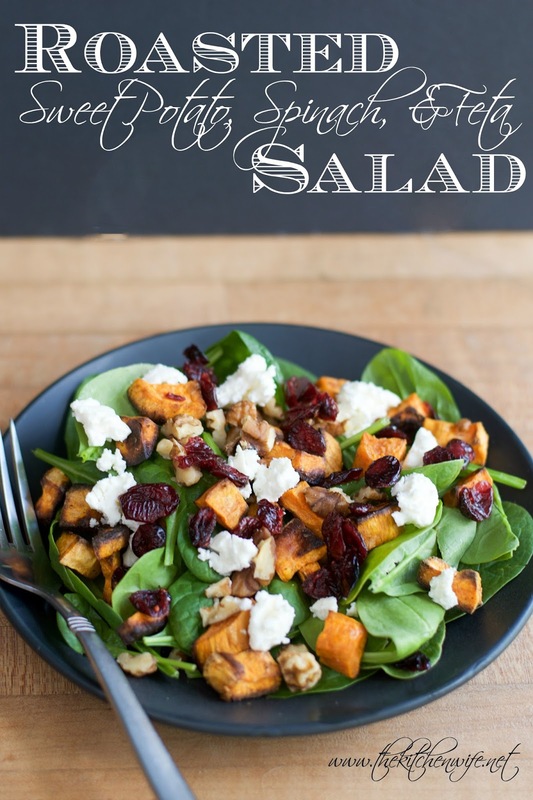 One of my favorites has been this Roasted Sweet Potato, Spinach, and Feta Salad. To get started you will need to preheat the oven to 400 degrees. Place the diced sweet potato on a foil lined baking sheet and drizzle with the extra virgin olive oil. Toss everything together so that everything is coated with the oil and seasoning. Place into a 400 degree and roast for 20-30 minutes until golden brown. Once the potatoes are finished roasting, remove them from the oven and let them cool for 10 minutes. Now all that is left is to assemble your salad! I place the bed of spinach on the plate, then the roasted sweet potatoes. After that place the walnuts and dried cranberries on the salad, followed by the feta! This Roasted Sweet Potato Spinach and Feta Salad is absolutely stunning in person, and the flavors are out of this world! You get the sweet, tart, savory, and saltiness you desire in every bite. It's the perfect salad to transition into fall with. For a dressing I used this roasted garlic vinaigrette that I purchased from Aldi, but you could use any that you like or none at all! If you wanted to bulk up this salad for a heavier meal, you could certainly add some grilled chicken, grilled salmon, or steak to it. The options are endless! 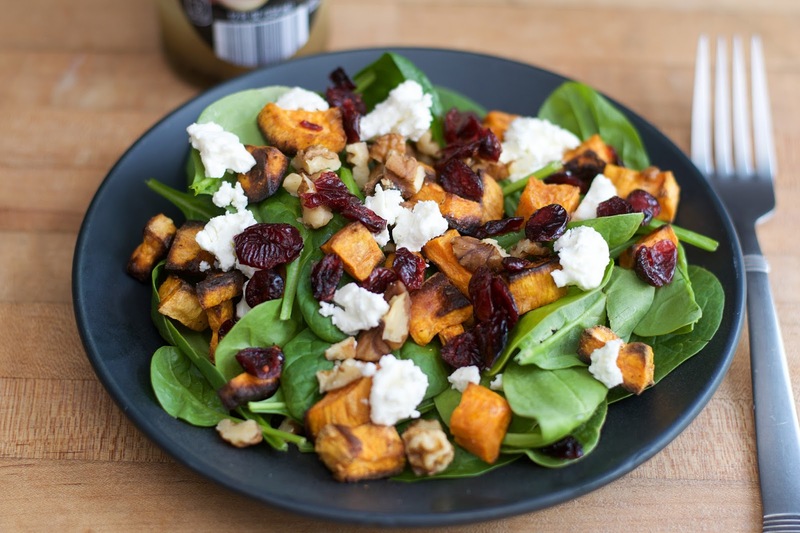 So tonight, get in the kitchen and give this Roasted Sweet Potato Spinach and Feta Salad a try tonight! 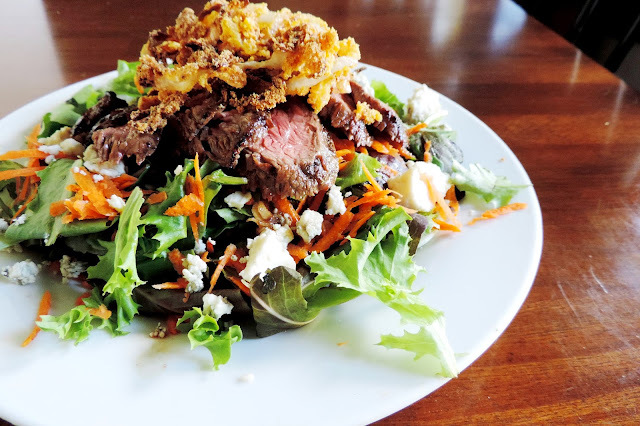 And if you like this recipe you will definitely want to give my Steakhouse Salad a try! Place the diced sweet potato on a foil lined baking sheet, drizzle with the extra virgin olive oil, salt, and pepper. Toss everything together so that all of the potatoes are coated. Place in the preheated oven and roast for 20-30 minutes until tender and golden brown. *To bulk up this recipe you can add grilled chicken, grilled salmon, or steak.